We all love penguins. They're cute, they're peculiar, they're an inspiration with their stoic resilience, and they're even a popular part of our cultural zeitgeist, thanks to movies like Happy Feet and Madagascar. But how would we feel about penguins the size of LeBron James? Researchers have found giant penguin fossils in Antarctica, which put the emperor penguin to shame. At over six feet tall, these ancient penguins may have been a tad intimidating, but if they're anything like their waddling descendants that we know and love, then we'd gladly welcome them back. In a study titled "New Giant Penguin Bones From Antarctica: Systematic and Paleobiological Significance," scientists Dr. Carolina Acosta Hospitaleche and Marcelo Reguero detailed their larger-than-life discovery. The team excavated fossil deposits on Seymour Island in Antarctica that belonged to the biggest penguin species to ever exist. 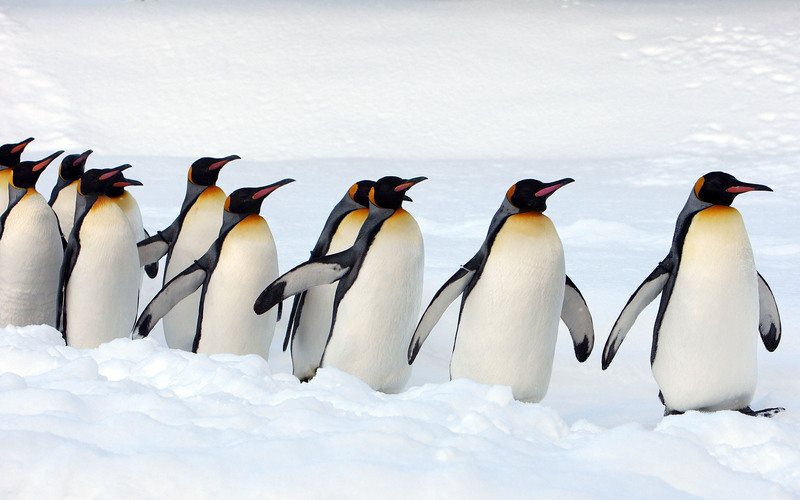 The Palaeeudyptes klekowskii lived around 37 to 40 million years ago during "a wonderful time for penguins, when 10 to 14 species lived together along the Antarctic coast," Hospitaleche told New Scientist. The fossils formed the most complete P. klekowskii skeleton to date, allowing the researchers to estimate their size. According to them, these ancient penguins were more than two meters long (that's more than 6 and a half feet) and weighed 115 kilograms (around 250 pounds). Yup, it's the LeBron of penguins alright — the NBA star is 6'8" and weighs 250 pounds. To put that in perspective of the penguins we know, the emperor penguin, which is the tallest and heaviest living penguin species, is a paltry three and a half feet in height and weighs a measly 90 pounds. Makes you want to pat them on the head and say, "Nice try," doesn't it? The emperor penguin isn't the only mini modern counterpart to a much larger prehistoric relative, however. We may be okay with towering penguins sliding around Antarctica, but not all of these ancestors were gentle giants. The Carcharodon megalodon sounds like some monster out of a B movie, something that ate nuclear sludge and grew to unearthly proportions. But this megashark actually existed. The megalodon can be traced back to the Cenozoic Era and was estimated to have disappeared 2 million years ago. The giant shark was around 60 feet long (about three times the length of a great white), each tooth measuring about seven inches long. Terrifying. This giant bird, which scientists believed lived 6 million years ago in Argentina, had a wingspan of 19 to 26 feet and weighed around 240 pounds. It could reach speeds of up to 150 miles per hour. In other words, it was basically a small airplane. The Argentavis preyed on animals as large as cattle, making modern hawks and eagles look like sparrows. Modern sloths are polarizing enough as they are — some people freak out over their cuteness, while others freak out over their creepiness. Just imagine elephant-size sloths running around in the wild. The Megatherium was one of the most prominent giant animals that roamed the earth after dinosaurs went extinct (the other one being the woolly mammoth). These creatures were about six meters (20 feet) long and weighed up to four tons, but despite its beastly appearance, they were mostly herbivores. The J. monesi is the largest recorded rodent in history, basically looking like gargantuan capybaras. And we can get down with that. Just imagine having one of these 10-feet-long critters flopping into your pool — scientists estimate their weight to be anywhere between 880 and 5,700 pounds! Unfortunately, they lived approximately from 2 million to 4 million years ago and haven't been around for quite some time. This giant snake was about 42 feet long and weighed 2,500 pounds. That's about 42 feet too long and 2,500 pounds too heavy, in my opinion. Not only was this Paleocene epoch monster a predator to just about everything, it likely inspired the unbearable-to-watch Jennifer Lopez movie Anaconda. Shame on this snake. This is one prehistoric creature I doubt anyone misses.